A two-dimensional graphic representation of the design and dimensions of the project, or parts thereof, viewed in a horizontal plane from above. a word with various meanings in Russian, including the following. (1) In cartography, a drawing using conventional symbols that represents on a plane a part of the earth’s surface; the scale is 1:10,000 or larger. (2) In architecture and other fields, a horizontal cross section or top view of a building or object. (3) In descriptive geometry, a horizontal projection. (4) A predetermined order or sequence of carrying out a program, work project, or measure—for example, an economic plan, production plan, strategic plan, or curriclum. (5) The scheme, design, or basic features of a written or oral work or presentation—for example, a lecture plan or the plot of a play. (7) Ground, the relative position of objects in a pictorial representation—for example, foreground, middle ground, and background; the relative dimensions of objects in a pictorial representation—for example, the word appears in the Russian terms for “close-up” and “long shot” in cinematography. in architecture. (1) A graphic representation on a definite scale of a horizontal view of a building (or one of its floors or internal areas), a group of buildings, or a populated area as a whole or in part. Depending on its purpose, the plan may show the design of walls and supports, the arrangement of furniture, the arrangement of equipment and the layout of technological processes in industrial structures, and urban green belts and transportation networks. The plan usually characterizes the shape and configuration of a structure. (2) A representation of the arrangement of the principal parts of a building at ground level or on different levels for multistory buildings and for groups of buildings on sloping sites. 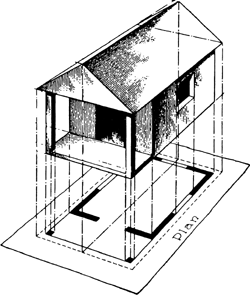 An orthographic drawing on a horizontal plane, as of an instrument, a horizontal section, or a layout. A large-scale map or chart of a small area. A 2005 Mercer Health & Benefits LLC annual national survey of employer-sponsored health plans found that much of the growth in implementing consumer-directed health plans took place among the nation's largest employers. I would propose a conference of health plan medical directors be convened to discuss this issue and develop an industry-wide approach to medical necessity decision making. That puts the employers at risk just as much as the health plans -- and a lot of small businesses have said they'll drop their workers' coverage rather than face that. Physicians often wonder how they can make any money seeing these patients, not recognizing that the capitation payments include payments for members of the health plan assigned to them whom they do not see frequently, if at all. Employers can use the scorecards to improve results from their health plans. Health plans are keeping a close watch on several drugs that are expected to see some action by the FDA soon. Rocky Mountain Health Plans Chief Financial Officer Pat Duncan said, "Intuitively, we understand that healthier employees correlate to lower healthcare costs, higher productivity and an overall better quality of life. The agent also should become fully comfortable with the organization that has packaged or organized an ERISA health plan. Margolis clarified the difference between a PHR, which is a portable health record provided by the health plan but controlled by the member, versus an electronic medical record (EMR) and an electronic health record (EHR).